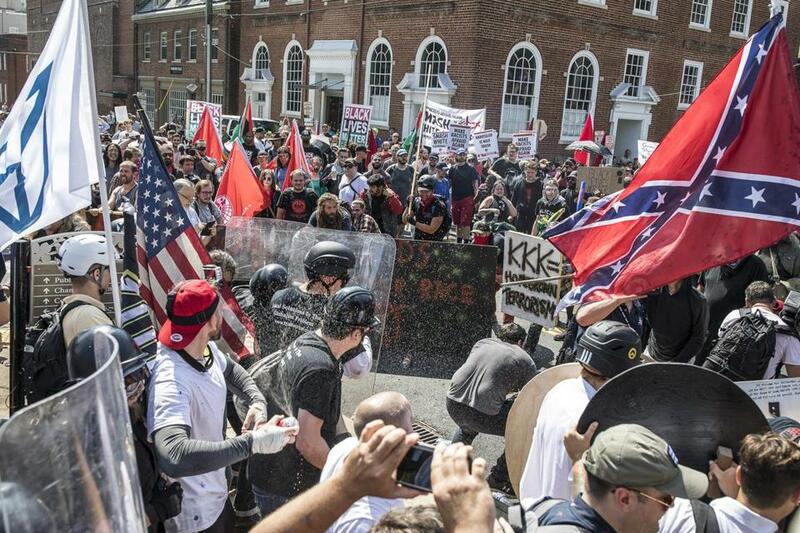 Riots at a rally in Charlottesville, Va., on Aug. 12, 2018. On Aug. 12, 2017, I was nauseous all day. Videos from the previous night’s white supremacist rally in Charlottesville, Va., flooded television and social media. The “alt-right” crowd that gathered at the Robert E. Lee monument the evening of Aug. 11 was met by a handful of brave anti-racist protesters. But on the 12th, anti-racist protestors swarmed the demonstration, and police seemed to stand by as white supremacist mobs beat people and discharged firearms into the crowd. When I’d heard that one of the rioters drove his car into a throng of people and killed 32-year-old Heather Heyer, I was not surprised, just sickened. I was disgusted not only by the death, but also by the possibility that racist mob violence was the new normal. Another march was scheduled for Boston on Aug. 19. I knew too much American history to believe the myth that such virulent racism was a strictly Southern tradition. The Boston march was called the “Free Speech” rally, but the Anti-Defamation League confirmed that the organizers were “in step with the alt-right in their hatred of feminists and immigrants, among others.” Protesters had more time to prepare, and it was clear there would be a critical mass of objectors convening in Boston Common. The victory in Boston was resounding. It allayed the queasy feeling we had harbored all week, and restored our faith in each other. But the Boston protest did not atone for Heather Heyer’s death, and we still live in perilous times. 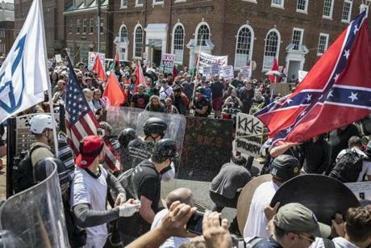 Though the shameless white supremacists who traveled to Charlottesville seem somewhat less emboldened, there were smaller demonstrations by similar groups earlier this month, and an anniversary march is scheduled for this weekend in Washington, D.C. More importantly, even when white supremacist mobs recede, the racism in our political system remains. People of color are traumatized on a daily basis in Trump’s America, and civil rights are under attack. There were signs of progress after the reckoning in Charlottesville and Boston, but we are still living in crisis. Immediately after Charlottesville, President Trump suggested there were “very fine people on both sides” of the conflict. House Speaker Paul Ryan, Senator Lindsey Graham, and Senate majority leader Mitch McConnell have played major roles cementing Trump’s agenda, but this was a bridge too far. Each legislator issued statements rebutting Trump’s comments and denouncing white supremacy, and McConnell said plainly, “There are no good neo-Nazis.” While it is pitiful that such a remark marked a turning point in the conversation, it was significant that the GOP refused to line up behind the president. We should be cynical about these lawmakers’ intentions, and Graham even went so far as to deny that Trump is racist, in January of 2018. But immediately after Charlottesville, we were genuinely terrified that nobody in the party would stand up to neo-Nazis, and that would have been a nightmare scenario. On Tuesday, the series is airing a look back at last August’s deadly Charlottesville rally. Another, less obvious, outcome of the backlash to Charlottesville is that many of the white supremacist organizers have been held to account in court. They have been arrested and charged with civil suits for instigating violence, and they are crippled by legal fees. These legal attacks are effective not only because individuals are held responsible for their actions, but also because they have caused in-fighting and defections within white supremacist groups, fracturing their organizational base. Finally, the news media took a step forward in the immediate aftermath of Charlottesville. On Aug. 15, the Associated Press proclaimed, “the term ‘alt-right’ should be avoided because it is meant as a euphemism to disguise racist aims.” In so doing, they explicitly defined the alt-right as a racist, anti-Semitic, and white nationalist movement. Until Charlottesville, prominent media outlets seemed willing to treat the racism at the heart of alt-right politics as part of the ideology rather than the entire belief system. This timidity normalized white supremacy and provided cover for racist spokespeople seeking a platform. Though such a policy should have been in place long before Charlottesville, the Associated Press’s decision was a direct result of the violence and clear repudiation of racism. Charlottesville was a turning point, as white supremacists failed to leverage the march into a full-fledged campaign of shameless racial terror. But we cannot take solace in such a meager victory. We remain in the midst of a devastating intensification of legal, institutionalized racism in America, with or without neo-Nazi marches. The “travel ban,” more rightly called a Muslim ban, was upheld by the Supreme Court despite the Trump administration’s lack of effort to disguise its discriminatory intent. The ongoing abuses of “detained” (read: imprisoned) immigrants are unconscionable. Such psychological and physical trauma is directly linked to the dehumanizing rhetoric coming from the White House and other outlets, rhetoric that, historically, has been invoked as a precursor to ethnic cleansing. This legal, weaponized racism is a deathly serious threat not only to immigrants, but to the human rights of everyone who resides in the United States. The ballot is one of the best tools for combatting these outrages in the immediate future, but voting rights are under relentless assault. The headline in most stories about the voting crisis is Russian interference in elections. But even prior to Russian intrusion, the Supreme Court’s 2013 decision to dismantle the Voting Rights Act had proved devastating. Voter identification laws passed prior to the 2016 election had distinct benefits for Republicans in states like North Carolina and Wisconsin, and reports of voter purges are increasingly common. These are targeted legal attacks on black and Hispanic voters, who constitute the base of the Democratic Party, and they undermine the civil rights of all Americans. One final reason to remain vigilant one year after Charlottesville is that discarding the facade of the alt-right label has not dramatically shifted the way racism is covered across the country. News outlets continue to publish stories implying that poverty is the cause of white racism and the Trump presidency. Poverty is real, and will probably get worse with protectionist economic policies, but study after study shows that racism and sexism, not economic hardship, are the primary reasons voters cast their ballots for Trump. Despite research demonstrating what “alt-right” really means, there is no such agreement about foregrounding racism in American politics, or about condemning white supremacist policy and rhetoric from government officials. We can’t expect the media to have the moral courage to call racism what it is if we can’t do the same in our daily lives. Our remembrance of both the tragedy at Charlottesville and the triumph in Boston must not detract from the urgency of the present. We cannot wait for more public demonstrations to reject white supremacy, and we must not be placated when white supremacists are rightfully shouted down and condemned. We must redouble and refocus our work toward institutional change for the sake of all who suffer from bigotry and discrimination, and for the sake of our democracy. Michael P. Jeffries is associate professor of American Studies at Wellesley College.